Flexible Tubing is used for fluid & gas transportation. As applications evolve so does the performance requirement for tubing. PTFE tubing provides a perfect blend of commercially available and high performance tubing. PTFE tubing typically means flexible tubing with wall thickness from 0.5 to 2 mm. PTFE tubing with wall thickness more than 2 mm is rigid and is called a PTFE tube or PTFE pipe. Generally PTFE tubing appears to be milky white to translucent however PTFE tubing can also be manufactured in many colours. PTFE tubing with high transparency is desirable in many applications as the visibility of the fluid flowing through the PTFE tubing is a key factor. It is also possible to manufacture PTFE tubing having electrical conductive properties or having enhanced resistance to abrasion. 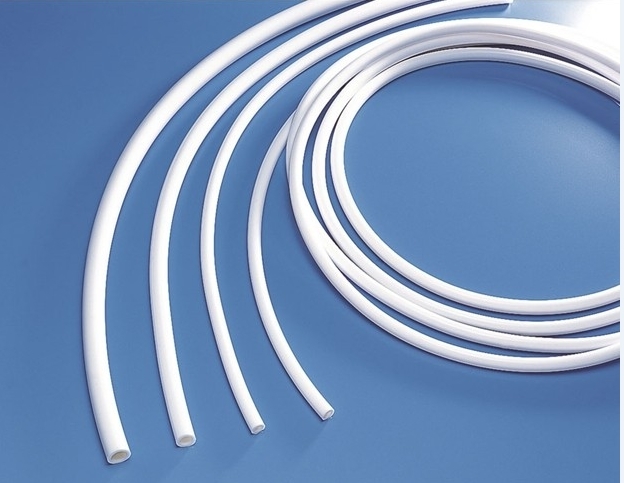 PTFE tubing are usually connected to machines, equipment or supply lines using metal or connectors manufactured using other Materials like PEEK and PVDF. So that the connections are leak free it is important that the PTFE tubing are manufactured with tight tolerances. Advanced Fluro Tubes manufactures PTFE tubing with dimension tolerances as low as 50 microns. Dimension tolerance for PTFE tubing depends on the ID and OD of the PTFE tubing. There are many secondary operations that can be done on PTFE tubing like flanging, flaring, cutting, spiral cuts, braiding etc. When braided the pressure rating increases many folds and bend radius decreases. PTFE tubing can be braided using stainless steel, polyester and aramid fabric to suit the application. PTFE tubing has a density of 2.15 – 2.18. PTFE tubing density is very important as it tells us about the performance we can expect of this PTFE tubing. Dielectric strength of PTFE tubing is 18 to 24 kv/mm. This parameter is important for electrical applications. This parameters basically tells us how much voltage will be insulated by PTFE tubing before it breaks down as an insulator. The higher the value to better. A value less than above mentioned range could indicate a issue in the manufacturing process or use of PTFE raw material not suited for high voltage electrical applications.Percentage elongation at break of PTFE tubing varies from 200 to 400%. PTFE tubing should have a smooth Internal diameter as they are used to transfer highly viscous fluids. When the ID of the tube is not smooth the viscous fluid tends to “stick” to the tube wall and eventually clogs the tube. Smooth ID is also important to food grade application. Smooth interval diameter of PTFE tubing prevents bacterial buildup. PTFE tubing in smoothbore form is flexible however as the dimensions increase the flexibility decreases. Often when used in tight spaces PTFE tubing cannot bend as per available space. To solve this problem PTFE tubing is convoluted. Convolutions ensures the bend radius is reduced and PTFE tubing can be bent and fitted in small spaces. PTFE tubing has a milky white to translucent appearance. There are application where visibility of the fluid is important to spot contamination for example or to check for deposition on PTFE tubing ID. For such applications increased transparency is required. Advanced Fluro Tubes can manufacture PTFE tubing with increased transparency.There are instances where an industry has specifications for colors of tubing that can be used for specific applications. 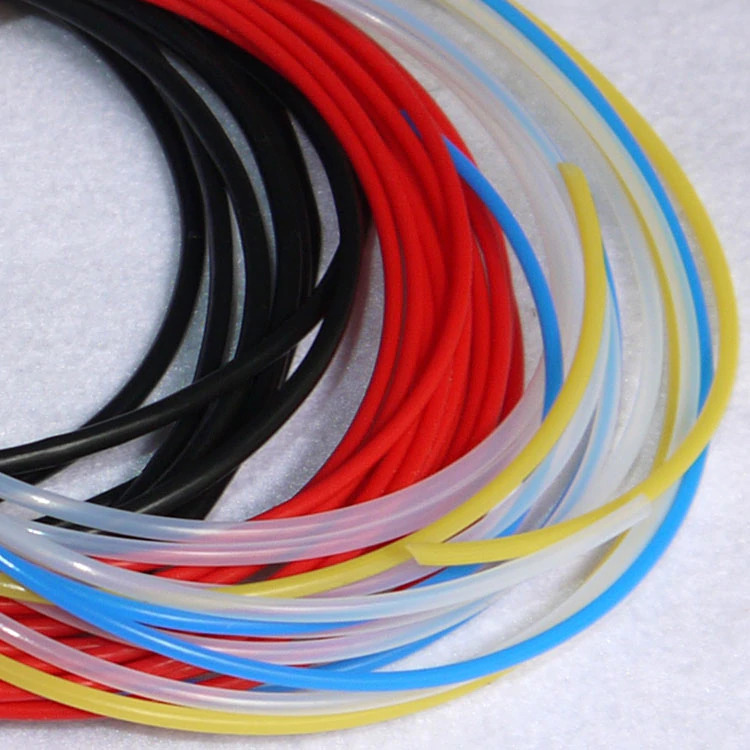 Advanced Fluro Tubes manufactures PTFE tubing in many colors like red, blue, yellow, green, orange and black. Antibacterial application require that the ID and OD of the PTFE tubing is very smooth and shiny. This ensures there is no entrapment of fluid and material reducing deposition of material. Material deposited on rough surfaces is difficult to clean using insitu steam cleaning. This eventually causes bacteria build up. The deposited material also reduces the flow and adversely affects the performance of the system. PTFE tubing is generally supplied as coils however can also be supplied as cut pieces or cut lengths.Some applications demand that PTFE tubing be rigid while others requires more flexibility. Advanced Fluro Tubes meets this requirement by proper material selection and tight control of process parameters. PTFE tubing are manufactured in continuous lengths upto 400 mtrs. It is therefore important to test for leakages via pin holes not visible to naked eyes. Advanced Fluro Tubes has systems in place to ensure PTFE tubing is tested to detect leakages. Post manufacturing PTFE tubing is subject to many tests to ensure all the properties of the PTFE tubing are within specified range. This ensures that the PTFE tubing can be used in a wide variety of applications. Of course there are certain applications, like in the aerospace industry, where commercial PTFE tubing will not work and which mandate a higher level of performance for which special raw material and different process parameters are required.For outdoor use it is important that tubing have excellent UV resistance and minimum water absorption . PTFE tubing scores very well in this areas as it has excellent UV resistance and a very very low water absorption. Overall PTFE tubing is extremely versatile and cost effective option which can be used in a vied variety of application. To know more about PTFE tubing technical details pertaining to your application please contact Advanced Fluro Tubes.